金森章泰. 【小児眼科診療】 疾患特性と診療指針 緑内障 続発緑内障.眼科プラクティス、文光堂，東京 2008;20:164-168. 金森章泰. 【抗加齢眼科学】 加齢の影響を見極める 加齢による解剖生理的変化と視覚機能の低下 視神経の加齢変化. 眼科プラクティス文光堂，東京、2008;22:54-60. 金森章泰. 【眼科薬物治療 A to Z】 疾患別治療戦略と処方の実際 眼窩・眼筋疾患肥厚性硬膜炎. 眼科プラクティス、 文光堂， 東京、2008;23:277-278. 金森章泰. 【眼科薬物治療 A to Z】 図説作用機序 Alzheimer 治療薬(メマンチン). 眼科プラクティス、文光堂，東京、2008;23:548-551. 金森章泰. 【視野】 緑内障管理と視野 視野から見た病期分類 AGIS スコア. 眼科プラクティス、文光堂，東京、2007;15:132-133. 金森章泰. 【視野】 Topics OCT 解析と視野の相関. 眼科プラクティス、文光堂，東京、2007;15:171-173. 金森章泰. 【視野】 One Point Advice 半側空間無視. 眼科プラクティス、文光堂，東京、2007;15:230-231. 金森章泰. 【緑内障診療の進めかた】 病型別診断と治療 続発緑内障 水晶体起因緑内障. 眼科プラクティス、文光堂，東京、2006;11:63-65. 金森章泰. 【緑内障診療の進めかた】眼圧測定 その他の眼圧測定法. 眼科プラクティス、文光堂，東京、 2006;11:130-131. 金森章泰. 【緑内障診療の進めかた】 One Point Advice 非典型的視野障害. 眼科プラクティス、文光堂，東京、2006;11:234-236. 金森章泰. 【緑内障診療の進めかた】 基礎知識 無作為化比較試験から得たエビデンス AGIS. 眼科プラクティス、文光堂，東京、2006;11:414-416. 金森章泰. 【これならわかる神経眼科】 疾患編 診断と治療 視路の異常 視交叉から外側膝状体の病変 視索症候群. 眼科プラクティス、文光堂，東京、 2005;5:208-209. 金森章泰. 【これならわかる神経眼科】 疾患編 診断と治療 肥厚性硬膜炎. 眼科プラクティス、文光堂，東京、2005;5:245. 金森章泰. 【スタンダード眼科顕微鏡手術】 緑内障手術 周辺虹彩切除術. 眼科診療プラクティス、文光堂，東京、2003;96:140-143. 金森章泰. 【緑内障診療のトラブルシューティング】 治療方針 病型別-全身疾患関連 上強膜圧上昇に伴う高眼圧. 眼科診療プラクティス文光堂，東京、2003;98:110. Mori S, Sakamoto M, Kurimoto T, Kanamori A, Ueda K, Inoue Y, Yamada Y, Nakamura M. Effectiveness and safety of sulcus fixation of Baerveldt glaucoma implants in glaucomatous eyes in patients who underwent multiple intraocular surgeries. Graefes Arch Clin Exp Ophthalmol. 2018;256:1953-1960. Sakamoto M, Matsumoto Y, Mori S, Ueda K, Inoue Y, Kurimoto T, Kanamori A, Yamada Y, Nakamura M. Excessive scleral shrinkage, rather than choroidal thickening, is a major contributor to the development of hypotony maculopathy after trabeculectomy. PLoS One. 2018 26;13:e0191862. Sakamoto M, Mori S, Ueda K, Akashi A, Inoue Y, Kurimoto T, Kanamori A, Yamada Y, Nakamura M. Diagnostic utility of combined retinal ganglion cell count estimates in Japanese glaucoma patients. Jpn J Ophthalmol. 2018;62:31-40. Matsumoto Y, Mori S, Ueda K, Kurimoto T, Kanamori A, Yamada Y, Nakashima I,Nakamura M.Impact of the anti-aquaporin-4 autoantibody on inner retinal structure, function and structure-function associations in Japanese patients with optic neuritis.PLoS One. 2017;12:e0171880. Shoji N, Arakaki Y, Nakamoto K, Yamamoto T, Kuwayama Y; Collaborative Bleb-related Infection Incidence and Treatment Study Group. Efficacy of predetermined therapeutic measures against bleb-related infection in the Collaborative Bleb-related Infection Incidence and Treatment Study.Acta Ophthalmol. 2017; 8. Nobuyoshi S, Kanamori A, Matsumoto Y, Nakamura M. Rescue effects of intravenous immunoglobulin on optic nerve degeneration in a rat model of neuromyelitis optica. Jpn J Ophthalmol. 2016;60:419-23. Ueda K, Kanamori A, Akashi A, Tomioka M, Kawaka Y, Nakamura M. Effects of Axial Length and Age on Circumpapillary Retinal Nerve Fiber Layer and Inner Macular Parameters Measured by 3 Types of SD-OCT Instruments. J Glaucoma 2016;25:383-9. Kashiwagi K, Kogure S, Mabuchi F, Chiba T, Yamamoto T, Kuwayama Y, Araie M; Collaborative Bleb-Related Infection Incidence and Treatment Study Group. Change in visual acuity and associated risk factors after trabeculectomy with adjunctive mitomycin C. Acta Ophthalmol. 2016;94:e561-e570. Ueda K, Kanamori A, Akashi A, Matsumoto Y, Yamada Y, Nakamura M. Evaluation of the distribution pattern of the circumpapillary retinal nerve fibre layer from the nasal hemiretina. Br J Ophthalmol. 2015;99:1419-23. Akashi A, Miki A, Kanamori A, Nakamura M. Aquaporin 9 expression is required for l-lactate to maintain retinal neuronal survival. Neurosci Lett 2015;589C:185-90. Ueda K, Kanamori A, Akashi A, Kawaka Y, Yamada Y, Nakamura M. Difference in correspondence between visual field defect and inner macular layer thickness measured using three types of spectral-domain OCT instruments. Jpn J Ophthalmol. 2015;59:55-64. Sakamoto M, Kanamori A, Fujihara M, Yamada Y, Nakamura M, Negi A. Assessment of IcareONE rebound tonometer for self-measuring intraocular pressure. 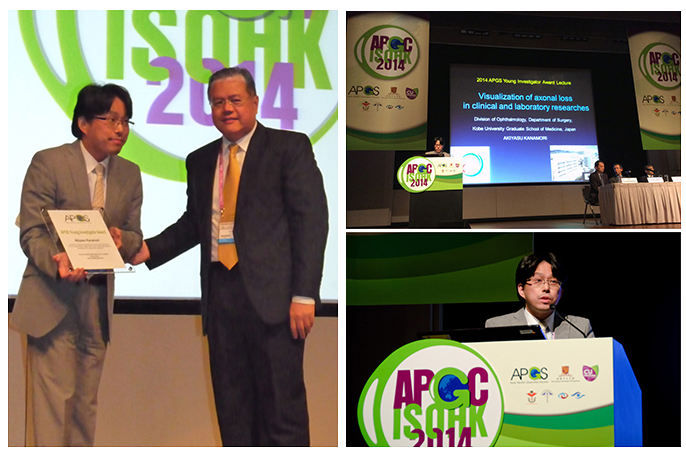 Acta Ophthalmol 2014;92:243-8. Miki A, Kanamori A, Nakamura M, Matsumoto Y, Mizokami J, Negi A. The expression of syntaphilin is down-regulated in the optic nerve after axonal injury. Exp Eye Res 2014;129:38-47. Matsumoto Y, Kanamori A, Nakamura M, Takahashi T, Nakashima I, Negi A. Sera from patients with seropositive neuromyelitis optica spectral disorders caused the degeneration of rodent optic nerve. Exp Eye Res 2014;119:61-9. Matsumoto Y, Kanamori A, Nakamura M, Negi A. Rat chronic glaucoma model induced by intracameral injection of microbeads suspended in sodium sulfate-sodium hyaluronate. 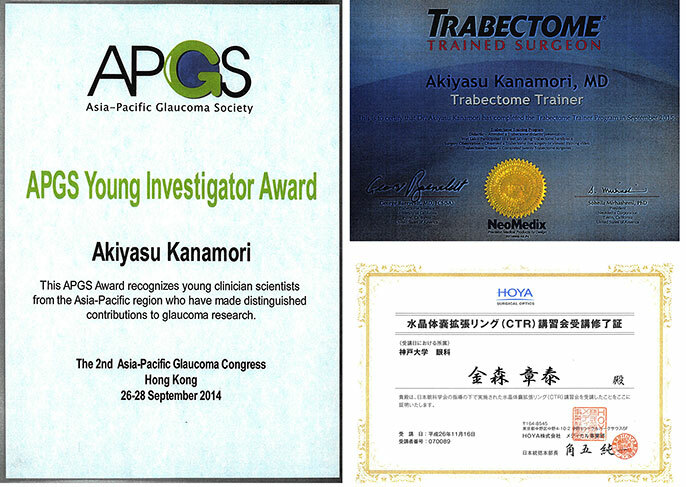 Jpn J Ophthalmol 2014;58:290-7. The 5-year incidence of bleb-related infection and its risk factors after filtering surgeries with adjunctive mitomycin C: collaborative bleb-related infection incidence and treatment study 2. Yamamoto T, Sawada A, Mayama C, Araie M, Ohkubo S, Sugiyama K, Kuwayama Y; Collaborative Bleb-Related Infection Incidence and Treatment Study Group. Ophthalmology. 2014 ;121:1001-6. Matsumoto Y, Fujihara M, Kanamori A, Yamada Y, Nakamura M. Effect of axial length reduction after trabeculectomy on the development of hypotony maculopathy. Jpn J Ophthalmol 2014;58:267-75. Akashi A, Kanamori A, Ueda K, Matsumoto Y, Yamada Y, Nakamura M. The detection of macular analysis by SD-OCT for optic chiasmal compression neuropathy and nasotemporal overlap. Invest Ophthalmol Vis Sci 2014;55:4667?4672. Nakano S, Kanamori A, Nakamura M, Mizukawa K, Negi A. Paraneoplastic optic neuropathy associated with cerebellar choroid meningioma. Eye (Lond) 2013;27:1220-1. Miki A, Kanamori A, Negi A, Naka M, Nakamura M. Loss of aquaporin 9 expression adversely affects the survival of retinal ganglion cells. Am J Pathol 2013;182:1727-39. Kanamori A, Nakamura M, Yamada Y, Negi A. Spectral-domain optical coherence tomography detects optic atrophy due to optic tract syndrome. Graefes Arch Clin Exp Ophthalmol 2013;251:591-5. Kanamori A, Nakamura M, Tomioka M, Kawaka Y, Yamada Y, Negi A. Structure-function relationship among three types of spectral-domain optical coherent tomography instruments in measuring parapapillary retinal nerve fibre layer thickness. Acta Ophthalmol 2013;91:e196-202. Kanamori A, Naka M, Akashi A, Fujihara M, Yamada Y, Nakamura M. Cluster analyses of grid-pattern display in macular parameters using optical coherence tomography for glaucoma diagnosis. Invest Ophthalmol Vis Sci 2013;54:6401-8. Akashi A, Kanamori A, Nakamura M, Fujihara M, Yamada Y, Negi A. The ability of macular parameters and circumpapillary retinal nerve fiber layer by three SD-OCT instruments to diagnose highly myopic glaucoma. Invest Ophthalmol Vis Sci 2013;54:6025-32. Akashi A, Kanamori A, Nakamura M, Fujihara M, Yamada Y, Negi A. Comparative assessment for the ability of Cirrus, RTVue, and 3D-OCT to diagnose glaucoma. Invest Ophthalmol Vis Sci 2013;54:4478-84. Nakamura M, Naka M, Tatsumi Y, et al. Filtering bleb structure associated with long-term intraocular pressure control after amniotic membrane-assisted trabeculectomy. Curr Eye Res 2012;37:239-50. Nakamura M, Ishikawa-Tabuchi K, Kanamori A, Yamada Y, Negi A. Better performance of RTVue than Cirrus spectral-domain optical coherence tomography in detecting band atrophy of the optic nerve. Graefes Arch Clin Exp Ophthalmol 2012;250:1499-507. Kanamori A, Nakamura M, Yamada Y, Negi A. Longitudinal study of retinal nerve fiber layer thickness and ganglion cell complex in traumatic optic neuropathy. Arch Ophthalmol 2012;130:1067-9. Kanamori A, Nakamura M, Tomioka M, Kawaka Y, Yamada Y, Negi A. Agreement among three types of spectral-domain optical coherent tomography instruments in measuring parapapillary retinal nerve fibre layer thickness. Br J Ophthalmol 2012;96:832-7. Kanamori A, Nakamura M, Tabuchi K, Yamada Y, Negi A. Effects of ocular rotation on parapapillary retinal nerve fiber layer thickness analysis measured with spectral-domain optical coherence tomography. Jpn J Ophthalmol 2012;56:354-61. Kanamori A, Catrinescu MM, Belisle JM, Costantino S, Levin LA. Retrograde and Wallerian axonal degeneration occur synchronously after retinal ganglion cell axotomy. Am J Pathol 2012;181:62-73. Mizokami J, Kanamori A, Negi A, Nakamura M. A preliminary study of reduced expression of aquaporin-9 in the optic nerve of primate and human eyes with glaucoma. Curr Eye Res 2011;36:1064-7. Naka M, Kanamori A, Negi A, Nakamura M. Reduced expression of aquaporin-9 in rat optic nerve head and retina following elevated intraocular pressure. Invest Ophthalmol Vis Sci 2010;51:4618-26. Kanamori A, Catrinescu MM, Traistaru M, Beaubien R, Levin LA. In vivo imaging of retinal ganglion cell axons within the nerve fiber layer. Invest Ophthalmol Vis Sci 2010;51:2011-8. Kanamori A, Catrinescu MM, Mahammed A, Gross Z, Levin LA. Neuroprotection against superoxide anion radical by metallocorroles in cellular and murine models of optic neuropathy. J Neurochem 2010;114:488-98. Kanamori A, Catrinescu MM, Kanamori N, Mears KA, Beaubien R, Levin LA. Superoxide is an associated signal for apoptosis in axonal injury. Brain 2010;133:2612-25. Kakutani Y, Nakamura M, Nagai-Kusuhara A, Kanamori A, Negi A. Marked cup reversal presumably associated with scleral biomechanics in a case of adult glaucoma. Arch Ophthalmol 2010;128:139-41. Nakamura M, Kanamori A, Nagai-Kusuhara A, Kusuhara S, Yamada Y, Negi A. Serous macular detachment due to diabetic papillopathy detected using optical coherence tomography. Arch Ophthalmol 2009;127:105-7. Naka M, Kanamori A, Tatsumi Y, et al. Comparison of mean deviation with AGIS and CIGTS scores in association with structural parameters in glaucomatous eyes. J Glaucoma 2009;18:379-84. Nagai-Kusuhara A, Nakamura M, Kanamori A, Negi A. Association of optic disc configuration and clustered visual field sensitivity in glaucomatous eyes with hemifield visual field defects. J Glaucoma 2009;18:62-8. Kanamori A, Naka M, Fukuda M, Nakamura M, Negi A. Latanoprost protects rat retinal ganglion cells from apoptosis in vitro and in vivo. Exp Eye Res 2009;88:535-41. Kanamori A, Naka M, Fukuda M, Nakamura M, Negi A. Tafluprost protects rat retinal ganglion cells from apoptosis in vitro and in vivo. Graefes Arch Clin Exp Ophthalmol 2009;247:1353-60. Tatsumi Y, Kanamori A, Nagai-Kusuhara A, et al. Nipradilol protects rat retinal ganglion cells from apoptosis induced by serum deprivation in vitro and by diabetes in vivo. Curr Eye Res 2008;33:683-92. Nagai-Kusuhara A, Nakamura M, Kanamori A, Nakanishi Y, Kusuhara S, Negi A. Evaluation of optic nerve head configuration in various types of optic neuropathy with Heidelberg Retina Tomograph. Eye (Lond) 2008;22:1154-60. Kanamori A, Naka M, Nagai-Kusuhara A, Yamada Y, Nakamura M, Negi A. Regional relationship between retinal nerve fiber layer thickness and corresponding visual field sensitivity in glaucomatous eyes. Arch Ophthalmol 2008;126:1500-6. Nagai-Kusuhara A, Nakamura M, Mukuno H, Kanamori A, Negi A, Seigel GM. cAMP-responsive element binding protein mediates a cGMP/protein kinase G-dependent anti-apoptotic signal induced by nitric oxide in retinal neuro-glial progenitor cells. Exp Eye Res 2007;84:152-62. Nakanishi Y, Nakamura M, Mukuno H, Kanamori A, Seigel GM, Negi A. Latanoprost rescues retinal neuro-glial cells from apoptosis by inhibiting caspase-3, which is mediated by p44/p42 mitogen-activated protein kinase. Exp Eye Res 2006;83:1108-17. Kusuhara S, Nakamura M, Nagai-Kusuhara A, Nakanishi Y, Kanamori A, Negi A. Macular thickness reduction in eyes with unilateral optic atrophy detected with optical coherence tomography. Eye (Lond) 2006;20:882-7. Kanamori A, Nagai-Kusuhara A, Escano MF, Maeda H, Nakamura M, Negi A. Comparison of confocal scanning laser ophthalmoscopy, scanning laser polarimetry and optical coherence tomography to discriminate ocular hypertension and glaucoma at an early stage. Graefes Arch Clin Exp Ophthalmol 2006;244:58-68. Tatsumi Y, Kanamori A, Kusuhara A, Nakanishi Y, Kusuhara S, Nakamura M. Retinal nerve fiber layer thickness in optic tract syndrome. Jpn J Ophthalmol 2005;49:294-6. Nakamura M, Kanamori A, Negi A. Diabetes mellitus as a risk factor for glaucomatous optic neuropathy. Ophthalmologica 2005;219:1-10. Nakamura M, Kanamori A, Kusuhara S, Ishibashi K, Negi A. Alternate total ophthalmoplegia and optic neuropathy associated with ulcerative colitis. Eye (Lond) 2005;19:235-7. Nagai A, Nakamura M, Kusuhara S, Kanamori A, Negi A. Unilateral manifestation of Leber's hereditary optic neuropathy after blunt ocular trauma. Jpn J Ophthalmol 2005;49:65-7. Kanamori A, Nakamura M, Nakanishi Y, Yamada Y, Negi A. Long-term glial reactivity in rat retinas ipsilateral and contralateral to experimental glaucoma. Exp Eye Res 2005;81:48-56. Mukuno H, Nakamura M, Kanamori A, Nagai A, Negi A, Seigel G. Unoprostone isopropyl rescues retinal progenitor cells from apoptosis in vitro. Curr Eye Res 2004;29:457-64. 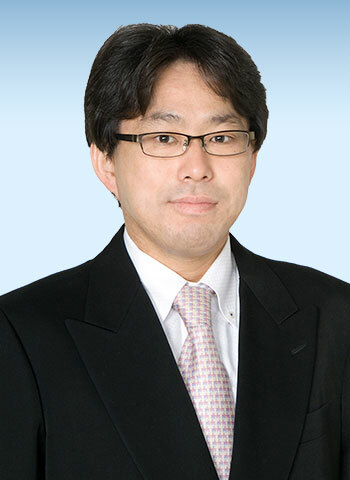 Kanamori A, Nakamura M, Nakanishi Y, et al. Akt is activated via insulin/IGF-1 receptor in rat retina with episcleral vein cauterization. Brain Res 2004;1022:195-204. Kanamori A, Nakamura M, Mukuno H, Maeda H, Negi A. Diabetes has an additive effect on neural apoptosis in rat retina with chronically elevated intraocular pressure. Curr Eye Res 2004;28:47-54. Kanamori A, Nakamura M, Matsui N, et al. Goniosynechialysis with lens aspiration and posterior chamber intraocular lens implantation for glaucoma in spherophakia. J Cataract Refract Surg 2004;30:513-6. 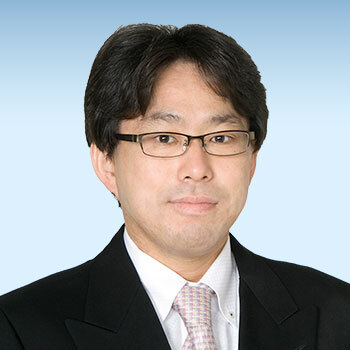 Kanamori A, Nakamura M, Matsui N, et al. Optical coherence tomography detects characteristic retinal nerve fiber layer thickness corresponding to band atrophy of the optic discs. Ophthalmology 2004;111:2278-83. Nakamura M, Kanamori A, Seya R, Maeda H, Negi A. A case of occult macular dystrophy accompanying normal-tension glaucoma. Am J Ophthalmol 2003;135:715-7. Kanamori A, Nakamura M, Escano MFT, Seya R, Maeda H, Negi A. Evaluation of the glaucomatous damage on retinal nerve fiber layer thickness measured by optical coherence tomography. Am J Ophthalmol 2003;135:513-20. Kanamori A, Escano MF, Eno A, et al. Evaluation of the effect of aging on retinal nerve fiber layer thickness measured by optical coherence tomography. Ophthalmologica 2003;217:273-8. 金森章泰：これからの緑内障診療のために NTG を考える(第 1回) NTG の病態. Frontiers in Glaucoma 2011;42:115-120. 金森章泰：【緑内障 Now!】 緑内障のトピックス 多施設共同研究でわかったことは? 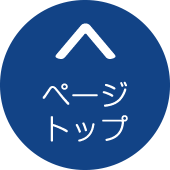 AGIS でわかったことは? あたらしい眼科 2008;25:9-11. 金森章泰：【緑内障の患者説明 正しい知識を伝えるための 3 ステップ】 重要な関連用語を押さえる!緑内障を理解するためのキーワード 18. 眼科ケア 2007;9:118-129. 金森章泰：目でみるシリーズ 緑内障手術の実践 トラベクロトミーの実際. Frontiers in Glaucoma 2006;7:119-125. 金森章泰：緑内障手術の基礎知識 トラベクロトミーの基礎. Frontiers in Glaucoma 2005;6:143-149. 金森章泰. 診断の指針 治療の指針 緑内障 早期発見. 綜合臨床2004;53:169-170. 金森章泰, 中島由美恵：【眼科疾患別パーフェクト検査マニュアル】 眼科基本検査のマスター 眼圧検査. 眼科ケア 2003:44-52. Copyright © 2019 KANAMORI EYE CLINIC. All Rights Reserved.